We offer FREE Delivery to ANY UK mainland address for orders over £100.00 and Free Worldwide Delivery on orders worth £150.00 and above. Most standard orders will be despatched in 3-4 working days by Royal Mail’s Signed For and a signature will be required upon delivery. For orders over £150, they will be sent by Royal Mail Special Delivery. Delivery to address outside UK is £6.50 per order. * Expedited delivery is £6.50 per order and if you require to receive your jewellery within 2-3 days , please choose the expedited delivery at checkout. They will be despatched within 2 working days. We offer FREE gift wrapping service for all of our customers. For orders under £100, your jewellery will be securely placed into a velvet bag and then into our beautiful exclusive branded gift box. 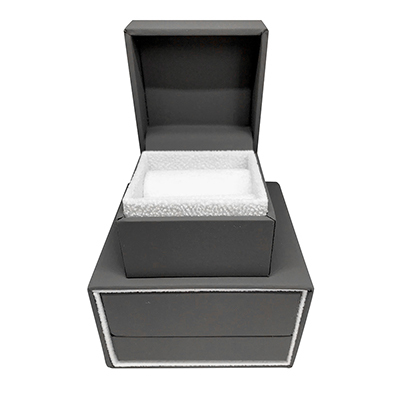 For orders over £100, your jewellery will be securely placed into our brand new luxury soft-touch suede grey packaging box unless the items are too large for the box. To ensure our customers are 100% happy with our products and service, we operate a 14-Day No Quibble Returns Policy, except for earrings of any kind, due to hygiene reasons. Our customers are able to login their account and send a returns request via our RAM system (Return Merchandise Authorisation). We cannot process any returns outside the RAM . All returned items are required to be in an unused and resalable condition, and in their original packaging. Due to hygiene reasons, we DO NOT accept any EARRINGS RETURNS (including drop earrings and stud earrings). We DO NOT accept returns on purchased gift vouchers. This does not affect your customary rights. We recommend you use a tracking delivery service for your returns. All returns will be dealt with within 3-5 working days from the day we receive the returned orders, whether it being refund, replacement or store credit. The refund will only be made back to the original payment method.